Dimensions: 21.5 cm height, 11 cm diameter. Gote Augustsson is one of the most important artists Swedish glass blowers. Perhaps Europeans. The design of this vase is signed by him for Ruda Glasbruk and belongs to the collection "Cobolt". The collection was made in the 70s in a limited edition. This vase is handmade and it is very beautiful, especially when exposed to light. 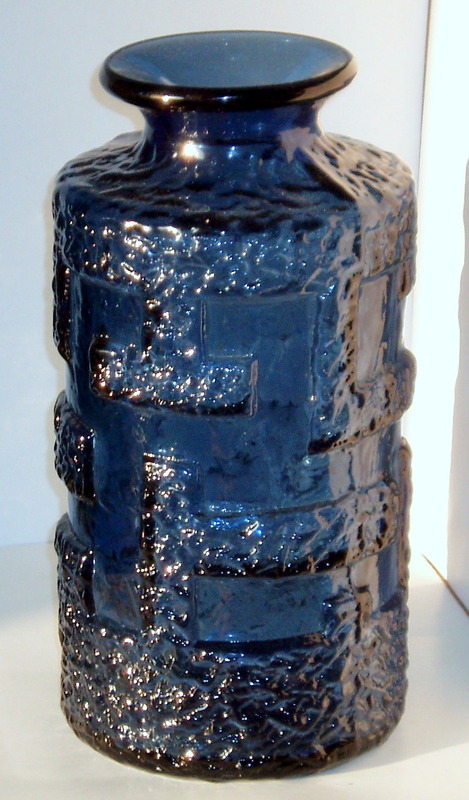 Göte Augustsson was overseer in 3rd Generation and self-taught in his glass art. He enjoyed working with wood forms in which his designs were blown and the uneven surfaces of the glass gave the characteristic appearance. This modeling could be used a few times, which made almost every piece is unique. The Cobolt-series got its intense dark blue and deep purple against the light color that appears by cobalt. Ruda existed from 1920 to 1972.